No animal symbolizes the marshes of the American South better than the American alligator. 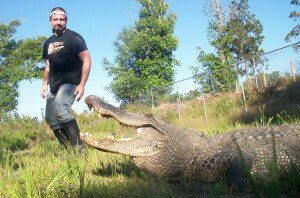 Saurage, owner of Gator Country in Beaumont, is one of several nuisance alligator control officers in the state and often gets the call when an unwelcomed gator shows up. The following is an excerpt from an article I wrote for the Port Arthur News and Orange Leader newspapers last week. Saurage said it is extremely important to teach people about the importance of alligators and other native wildlife. Two weeks ago, I accompanied their crew on an alligator rescue at the Sunoco Plant in Nederland, TX. It was amazing to watch them meticulously pursue the 10 foot, 8-inch alligator and bring it in alive. “It requires a team do it like we do and I have a great one including some wonderful ladies that don’t mind getting muddy and getting hold of the gators,” he said. Saurage said alligators are moving around now that temperatures are rising and the breeding season is upon us. “It makes them scatter and that’s why you see more on the roads and sometimes in people’s yards and pools,” he said. It is important to remember not to approach them closely and certainly not to feed them. “When people start feeding alligators the gators start associating people with food and that is never good out in the wild. It’s best to observe and enjoy from a distance,” Saurage said. If you an up close and personal alligator encounter, pay Gator Country a visit. There you can hold a baby alligator, feed them in a proper setting and encounter many other reptiles from the United States and around the world. The author getting close to the big gator rescued by the Gator Country crew. For more information go to www.gatorrescue.com.